Photographer is Engle Brothers of Williamsport, Pennsylvania. Otherwise undated and unidentified. I think there are just trying to be real still for the camera. Yes, it’s quite likely that I’m reading more into it than is there. They’re close together but physically isolated from each other, as if boundaries have been drawn. The boy behind the chair looks desperate, as if he’s being smothered. Could be accidental but I do see what you mean. I saw the same thing in the boy, Paul. Maybe the “unused to posing” thing, but maybe a cry for help. This is one of those moments when I wish I could see more photos of them. 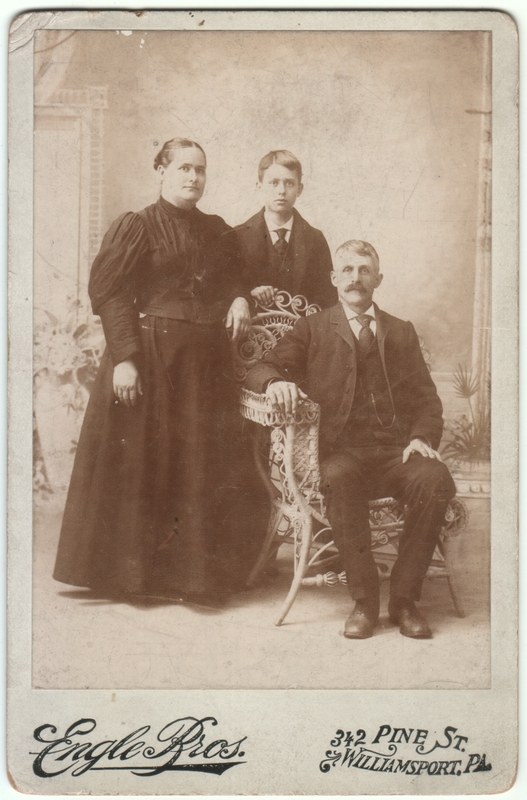 The woman looks indifferent, the boy looks trapped, and the man, in his effort to show erect posture, inadvertently looks like he is pulling himself away from the others. I think the chair doesn’t help either, like the back and arm are putting up barriers between them.